HAIYAN is undoubtedly the strongest tropical cyclone this year on the planet, and is the strongest landfalling typhoon since records began. Being one of the last storms to form in a spate of tropical cyclone events since September, HAIYAN developed as a disturbance near Chuuk in early November at latitudes as south as 6°N. The disturbance intensified into tropical depression 31W in the afternoon of November 3. As is usual in this season, the subtropical ridge was firmly anchored in the Pacific at that time. 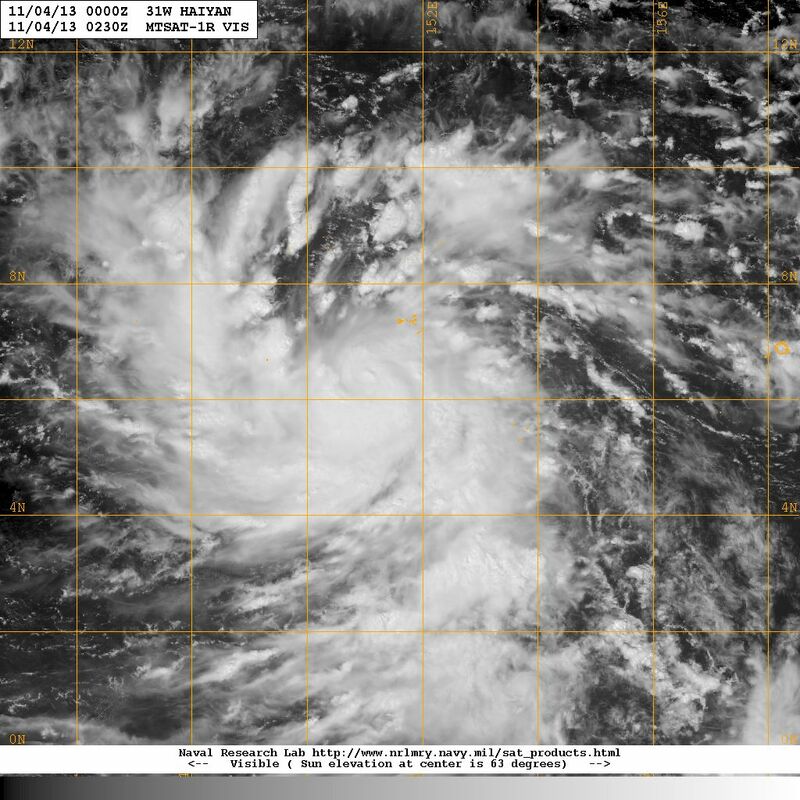 31W was thus expected to track W/WNW and impact the Philippines. The area was very favourable for storm development because of very low vertical wind shear and the warm sea surface temperatures. 31W became more organized on November 4, and was upgraded into a tropical storm by the JMA at 8 am. 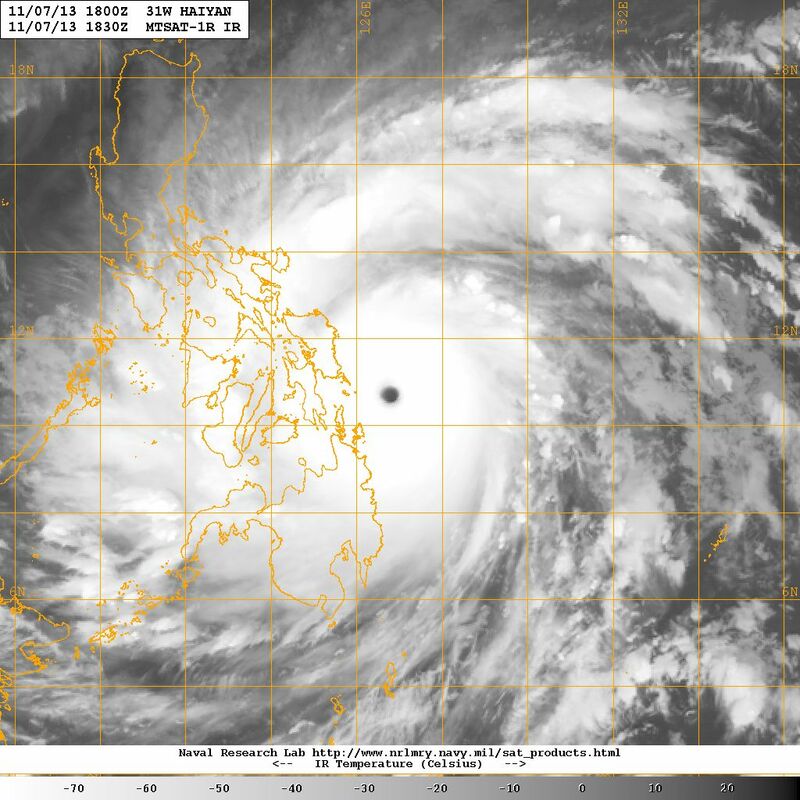 Tha named assigned to 31W was HAIYAN. It was contributed by China, meaning petrel. Due to the stability of the subtropical ridge, forecast tracks among different agencies were very consistent. The only difference was perhaps the track speed --- under strong steering force, HAIYAN was expected to accelerate to above 30 km/h. HAIYAN's circulation expanded and became tighter on November 4. The JTWC upgraded HAIYAN into a typhoon in the morning of November 5. Moderate intensification took place during the day, and forecasts started to predict intensification to category 4 before HAIYAN's landfall at eastern Philippines. The JMA seemed to be rather late in upgrading HAIYAN into typhoon status. 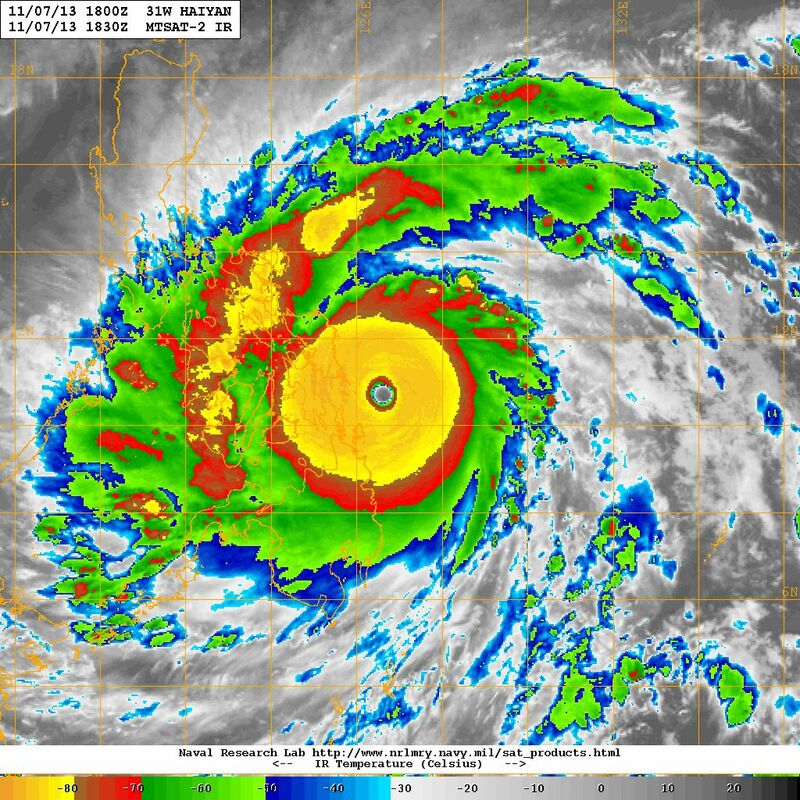 The upgrade was made at 2 am November 6; by that time HAIYAN's central dense overcast had already been established with a small eye embedded in it. HAIYAN underwent rapid intensification during the night. Its intensity was estimated at 105 knots (194 km/h) by the JTWC at 2 am November 6. This was revised upwards to 130 knots (241 km/h) at 8 am as its eye cleared a bit. The storm's eyewall cloud top temperature dropped to below -80 degrees during the day, indicating very strong convective activity near the storm's centre. The intensity estimate increased to 135 knots (250 km/h) at 2 pm and further to 140 knots (259 km/h) at 8 pm, making HAIYAN the fourth category 5 super typhoon in this basin in 2013. The JMA also adjusted its intensity estimate quickly, from 80 knots (148 km/h) in the morning to 90 knots (167 km/h) in the afternoon and 110 knots (204 km/h) at night. The storm's eye enlarged as it became category 5. Its convections were concentrated near the centre, and the cloud bands were relatively sparse in its periphery. The storm reacted to a slight intensification of the ridge to its east, and started to pick up some latitude. It has also accelerated to around 30 km/h. Over the night of November 6-7, HAIYAN maintained its extremely deep convections (i.e. the area within which cloud top temperatures reached -80 degrees, appearing as a yellow ring in NRL's colour-enhanced infrared imageries). 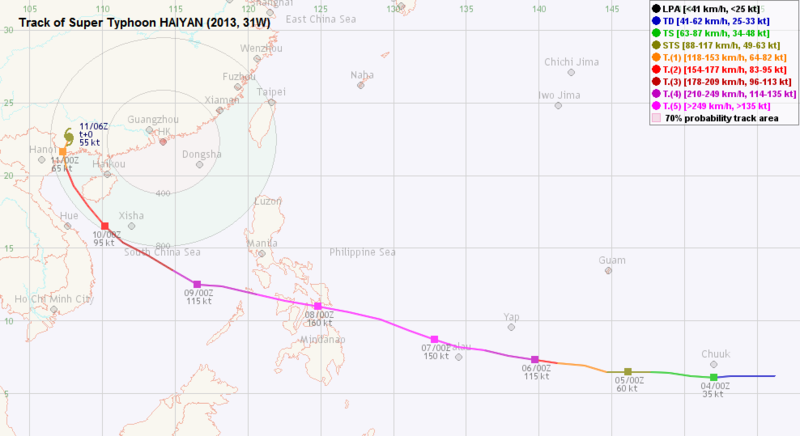 This prompted the JTWC to upgrade HAIYAN further to a 150-knot system (278 km/h). The convective activity weakened slightly at daybreak, and together with diurnal variation the yellow ring became broken although still covering a substantial part of the central dense overcast. 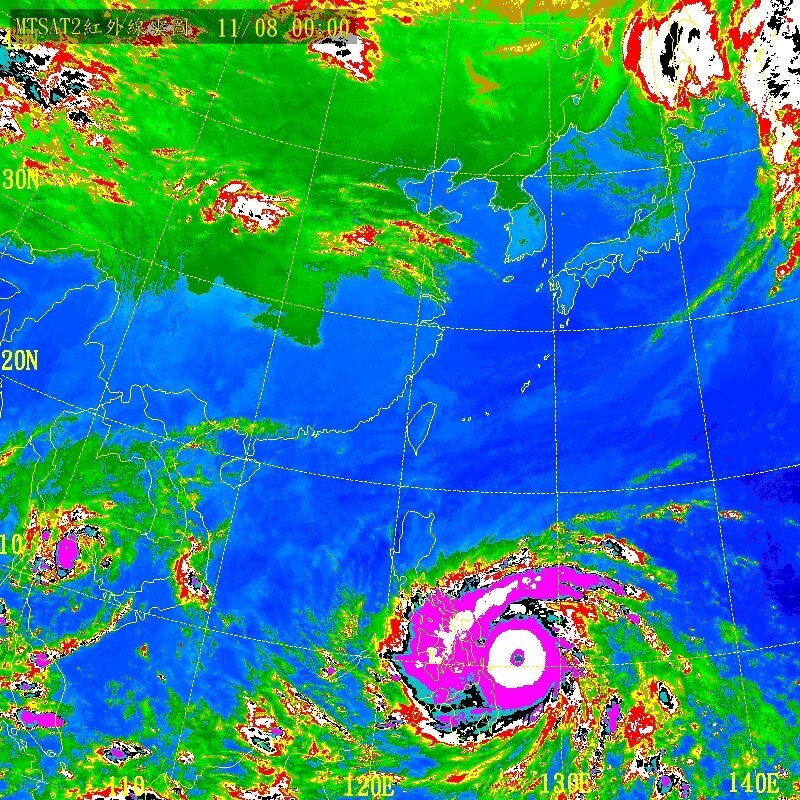 HAIYAN's eye, however, remained very clear throughout. 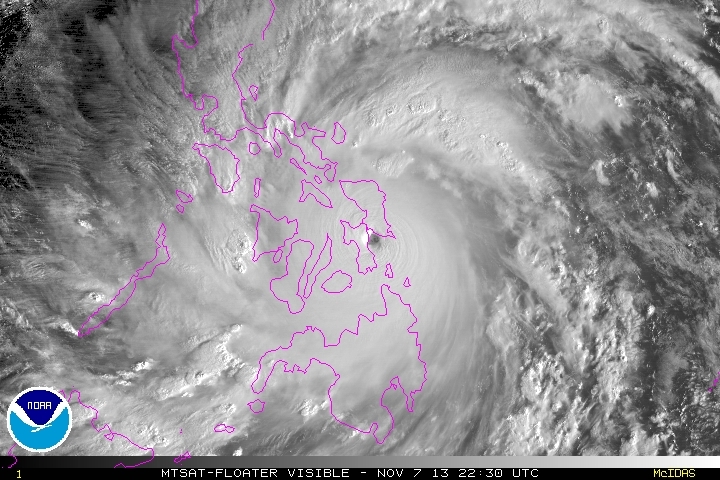 After some period of consolidation, HAIYAN's central dense overcast deepened near dusk on November 7. The yellow zone re-emerged and this time covered essentially the whole eyewall. The storm acquired some characteristics of an annular cyclone; its round eye was deeply embedded within a very thick eyewall, but spiraling bands could still be observed in its periphery. The coverage and persistence of this yellow area was extremely rare in recent history, and as a result the JTWC further upgraded HAIYAN's estimated intensity to 165 knots (306 km/h) at 8 pm. Such an intensity had never been seen in decades. It tied with super typhoon TIP's peak intensity, and is the highest since reliable records began. The JMA also reacted to HAIYAN's excellent structure by upgrading its intensity to 125 knots (232 km/h) --- the fourth cyclone to reach this strength since records began. * In HKO's annual TC report, HAIYAN's maximum intensity was adjusted upwards to 285 km/h. Just a few hours after this upgrade, HAIYAN made landfall at Guiuan in Eastern Samar near 5 am. The landfall was brief and at around 7 am, it made its second landfall at the island of Leyte, passing just south of Tacloban. 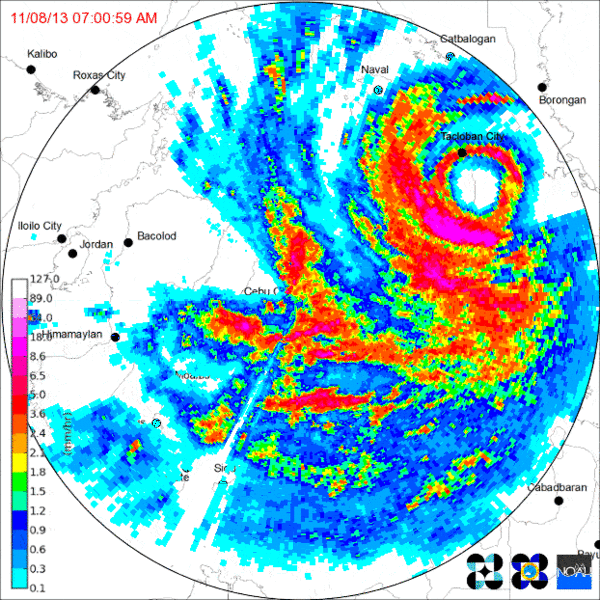 Leyte is a larger island and HAIYAN started to weaken more quickly. Its eye shrank in size and the yellow region diminished. At 35-38 km/h, HAIYAN maintained a very high speed while crossing the Philippines. It reached Panay near 11 am and spent the afternoon crossing western Philippines. Due to HAIYAN's extreme wind speed and destructive storm surge, regions near HAIYAN's initial landfalls suffered catastrophic damage, especially in the vicinity of Tacloban. Cities and villages were inundated and most weaker constructions were blown away. The death toll in the country exceeded 5,000; this makes HAIYAN one of the deadliest natural disasters (and the second deadliest tropical cyclone) in the Philippines. 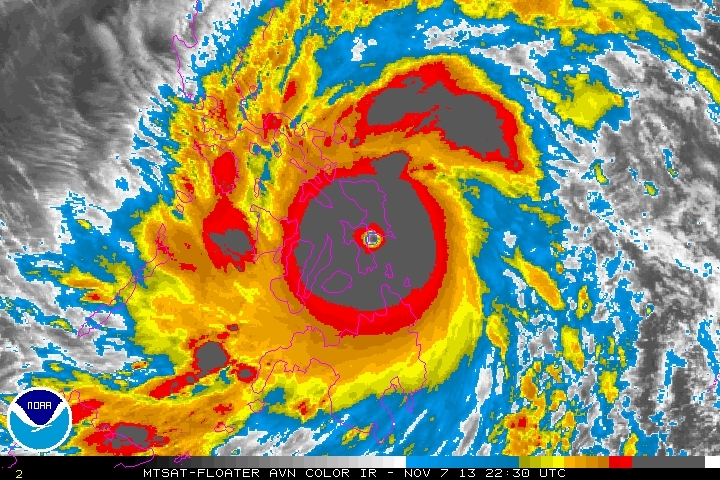 Most meteorological equipment in the landfall area broke or was blown away during HAIYAN's impact; it is therefore almost impossible to ascertain HAIYAN's actual strength at its full fury. 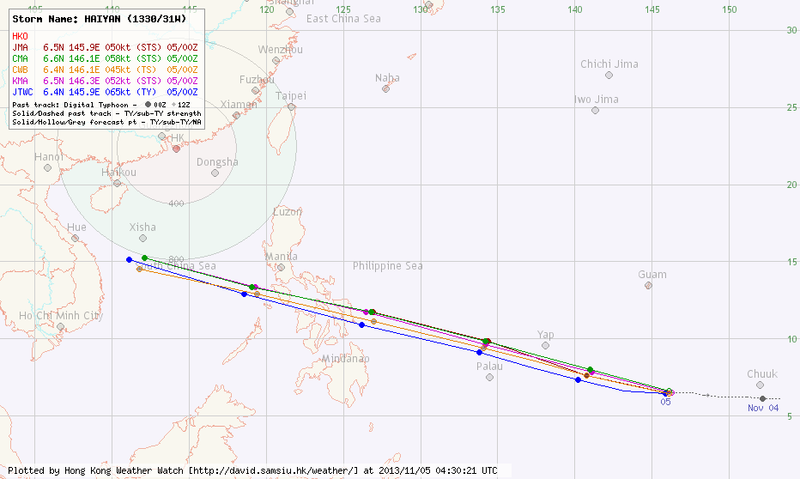 Storm chasers at Tacloban (iCyclone page) recorded 960.8 hPa and 960.3 hPa on their two devices at 7:12 and 7:20 am respectively --- that was when HAIYAN was passing to its south. According to Jeff Master's blog, a barometer at Tacloban airport (1 mile south of the hotel the storm chasers were residing) registered 955.6 hPa at 7:15 am before power was lost. This and the fact that the airport is around 17 miles from the storm centre gives a linearly extrapolated pressure of between 880 and 890 hPa at HAIYAN's centre. Since the pressure gradient is likely to be even steeper near its centre, HAIYAN could well have minimum pressure less than 880 hPa before it reached Leyte. However, unless further readings are available, it is impossible to tell whether HAIYAN is stronger than TIP which had a minimum pressure of 870 hPa (lowest pressure ever recorded). It is worth noting that an unofficial reading of 889 hPa was recorded at Guiuan at 5:01 am, but there is no subsequent verification of its validity. Due to its high initial intensity, HAIYAN lost substantial strength while crossing the relatively flat terrain in the Philippines. JTWC's intensity estimate decreased from 170 knots (315 km/h) to 160 knots (296 km/h) just after HAIYAN's landfall, and further to 145 knots (269 km/h) at 2 pm. It weakened into category 4 before moving into the South China Sea in the night of November 8. 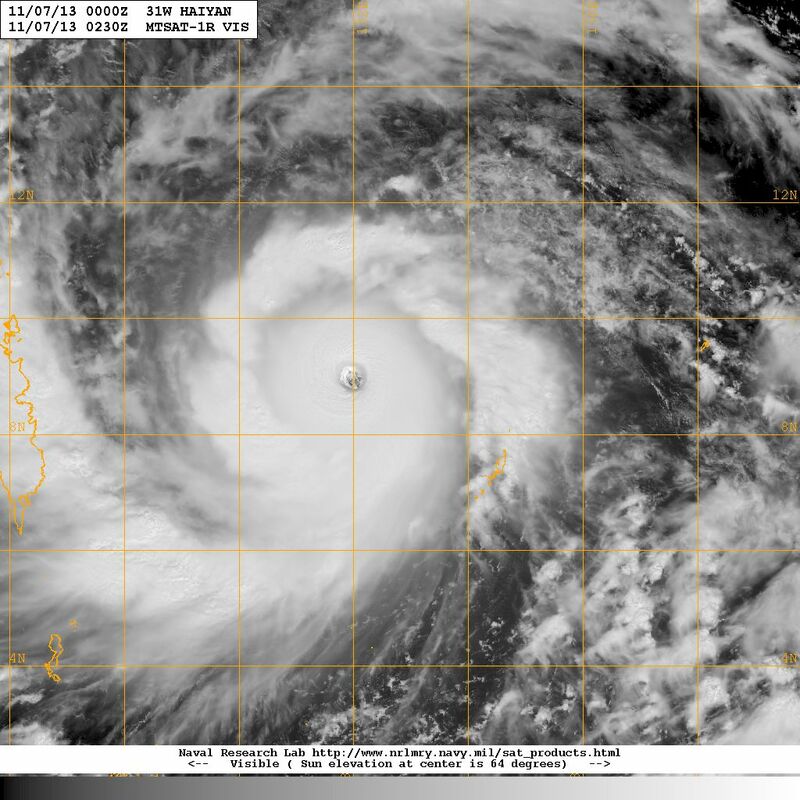 Although HAIYAN's structure was still compact, land interaction resulted in a cloud-filled eye and slightly asymmetric appearance. 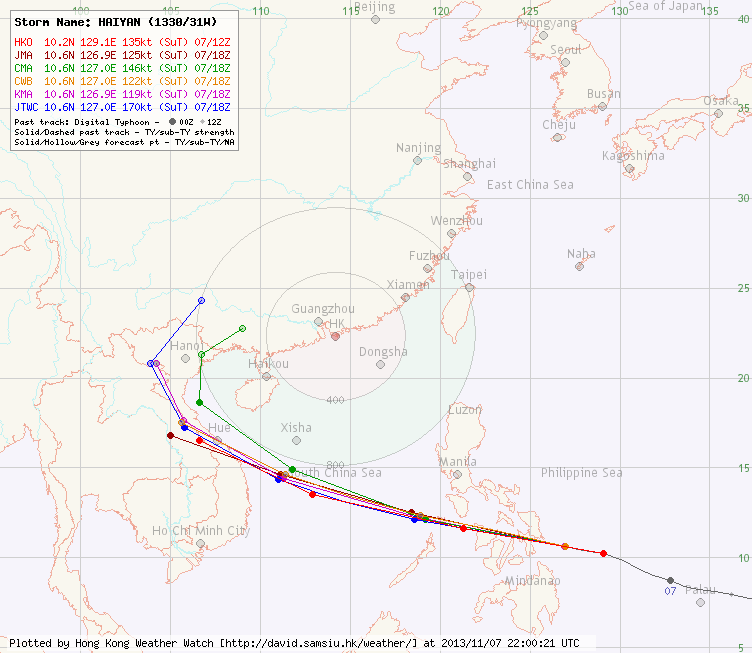 Regarding HAIYAN's track, numerical models and official agencies were predicting a gradual turn to the NW as the subtropical ridge was forecast to weaken. However it was uncertain whether the storm would make landfall in central Vietnam, causing further damage. HAIYAN turned west briefly, before resuming a WNW track on November 9. HAIYAN never recovered its round eye, and kept weakening while travelling in the South China Sea. 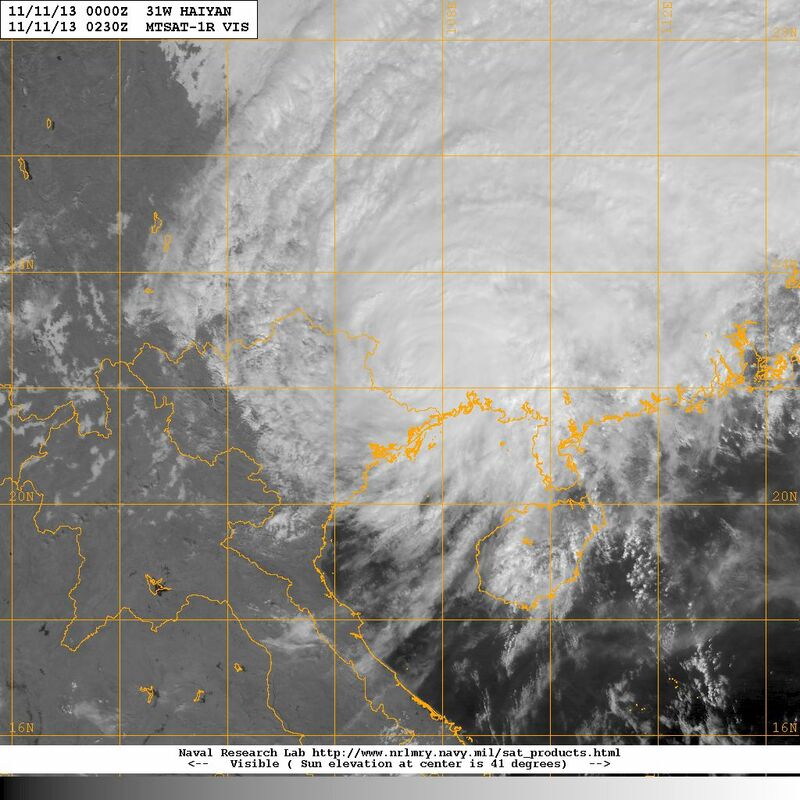 HAIYAN eventually avoided central Vietnam as it turned even more poleward in the night of November 9-10. The storm entered Hong Kong's 800 km area on November 10, and later skirted the southwestern coast of Hainan. 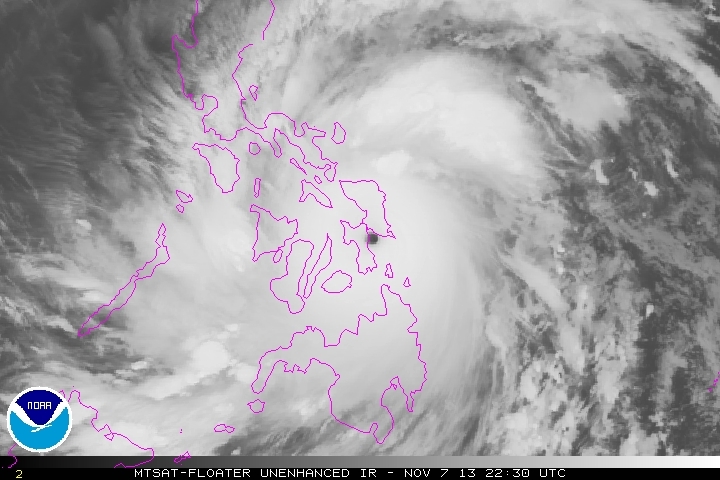 Land interaction became apparent again and HAIYAN lost intensity at a quicker pace. It finally made landfall near the China-Vietnam border early on November 11 as a marginal typhoon, and soon recurved as it reached the subtropical ridge axis. However, without the supply of moisture HAIYAN weakened fairly rapidly inland; although it started to move east, there was no significant threat to Hong Kong. Due to the combined effect of HAIYAN and the subtropical ridge, winds in Hong Kong were rather strong on November 10/11 with occasional showers. A teenager was drowned as he was swept away by waves at Cheung Sha Beach in Lantau on November 10. HAIYAN's remnants brought heavier rain to the territory on November 12, and 33.4 mm of rainfall was recorded at the Observatory on that day. 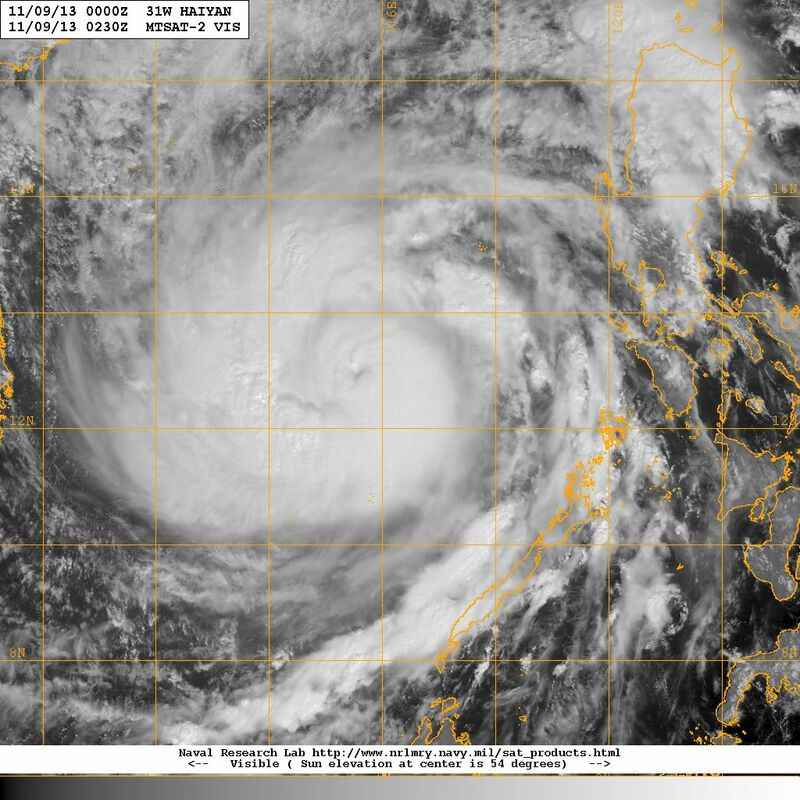 Figure 4 - Satellite image at 10:30 November 7 showing HAIYAN's clear eye. It was at category 5 at that time. Figure 10 - Calculated wind field at 2 am November 8. Note the perhaps impossible sea level pressure estimate. 7.5. MET YIELDS 8.0. PT YIELDS 6.5. DBO MET. 1230Z. FT IS BASED ON MET FOR THESE REASONS. TO REPORT CURRENT INTENSITIES OF 8.0. FT IS BASED ON MET.